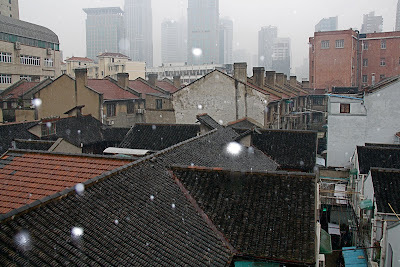 Life on Nanchang Lu: Let it snow! We have a house full of Australians staying for Christmas. In my part of Australia it never snows. Not ever. A really cold winter day might plummet to, oh, 13C. Everyone puts on their boots and jumpers when it hits 20C. 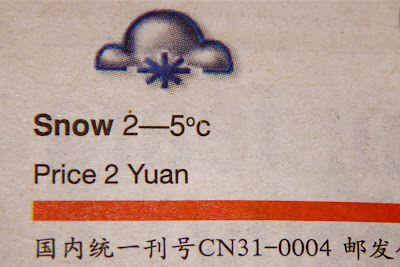 So imagine the collective household excitement when we saw today's newspaper.........snow predicted! By late morning the first flakes were falling. Had you been here, you would have noticed a group of eleven foreigners walking down Haui Hai Lu, twirling around with their heads back and their mouths open, and causing a lot of commotion on the footpath. You can see the view from our lane below.